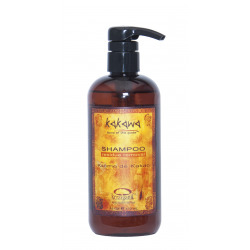 is an amazing blend of cacao derivatives and other plant-based ingredients designed to restore health to damaged hair. As a plus, this Shampoo is Salt & Sulfate-Free, so it cleans gently while maintaining and adding nutrients for a healthy vibrant hair. Apply to wet hair. Massage well onto scalp and hair into a lather. Then rinse. 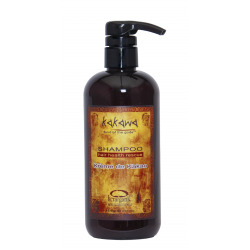 Follow with our Kakawa Conditioning Cream. Water/Aqua, Disodium Cocoyl Glutamate (plant-derived), Cocamidopropyl Betaine (from coconut oil), Decyl Glucoside (plant-derived), Theobroma Cacao (Cocoa) Seed Butter, Theobroma Cacao (Cocoa) Extract, Cocos Nucifera (Coconut Oil), Butyrospermum Parkii (Shea) Butter, Aloe Barbadensis (Aloe Vera) Leaf Extract, Biotin, Fragrance/Parfum, Polyquaternium-7, Cocamide DEA (from coconut oil), Caprylic/Capric Glycerides (from palm oil), Panthenol (vitamin B5), Ethylhexyl Methoxynnamate (UV protection), Amodimethicone (mineral-based), C11-15 Pareth-7, Laureth-9, Tridecth-12.